This article was originally written by Cathy Phillips and published on Cleveland.com on September 24, 2013. For the third time in just over four years, a new restaurant has opened at the corner spot in Avon Lake’s Towne Center shopping plaza. 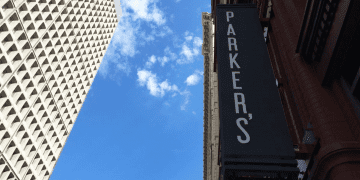 Business partners James and Victoria Mowbray and Paul Kalberer are hoping that the third time’s the charm for their new Parker’s Grille and Tavern, which opened its doors in July. The Mowbrays reside in Avon Lake with their son Parker, after whom the restaurant is named. For the last decade, James served as general manager for Cleveland’s Morton’s The Steakhouse, where Kalberer was also executive chef. In addition to the main dining room, the restaurant features a beautifully landscaped patio and banquet space next door that can accommodate 100 guests. Mowbray’s goal is to ensure that customers are enjoying their experience at Parker’s. “I think the personal touch will really help us out here,” he said. The restaurant features a variety of hand-cut steaks, pasta, and fresh seafood, as well as burgers, sandwiches, and bar noshes. All dressings and sauces are crafted in house. Fifteen beers are available on draft, with another 20 in bottles. A variety of wines is available by the glass or bottle. House cocktails ($7.50-$9) include a Manhattan mixed with Woodford Reserve bourbon, black raspberry liqueur, and an orange twist; “Parker’s Palmer” with tea-infused vodka and lemonade; and a puckery-sweet “lemontini” with Italian limoncello, lemon vodka, and fresh lemon juice. Happy hours run from 4-6 p.m. and feature food and drink specials, such as discounted drafts and well drinks, and $5 glasses of wine and bar snacks, including margherita flatbread with tomatoes and fresh mozzarella and basil; fresh walleye sliders; duck wings with chipotle-raspberry sauce; and house-made root vegetable chips dressed luxuriously with walnuts, blue cheese, and fragrant sage. Our recent visit began auspiciously with a quartet of succulent, frenched lamb chops dusted with Cajun seasonings ($12). We ate them like lollipops, dipping them in chef Kalberer’s luscious spiced ranch sauce, and savoring every bite. A bowl of root vegetable bisque ($4) followed, thick and sweet from the puréed roasted vegetables and tangy with goat cheese. Wild mushroom flatbread ($12) was earthy and nutty, with a satisfyingly crisp, thin crust. 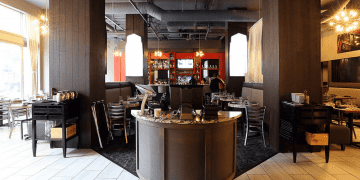 Other entrée choices include jumbo shrimp scampi with gemelli ($17); molasses- and coffee-marinated pork chops with smashed redskins; and pan-seared wild salmon with garlic mashed potatoes and spicy court bouillon ($21). Hand-cut steaks range from a $25, 8-oz filet mignon to a $35, scale-tipping 22-oz rib-eye. All are available with toppings ($5-$7), such as sherry onions, or sauces ($3), such as whiskey peppercorn. Share something sweet ($6) to finish, such as New York-style cheesecake, seasonal bread pudding, or warm, chocolate truffle cake. 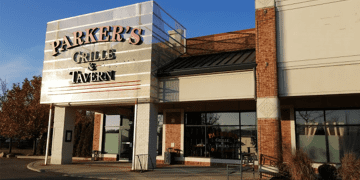 Parker’s Grille and Tavern is located at 32858 Walker Road in Avon Lake. Business hours are 4-9 p.m. Sunday; 4-10 p.m. Tuesday through Thursday; and 4-11 p.m. Friday and Saturday (closed Monday). Call 440-933-9400. Find the menu online at www.parkersgrilleandtavern.com. Follow on Facebook.